The flowers are fading and going to seed. Many people tend to think of the greenery in a garden as nothing but a backdrop for the flowers. As the weather turns colder, it's easier to see whether or not a garden has "good bones." Trees, shrubs, pathways and walls define where a garden begins and ends. 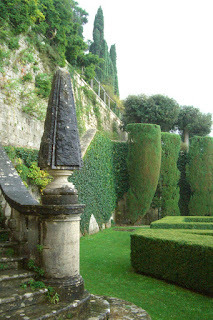 Classic geometric hedges and topiaries were never my favorites, but they have grown on me. These living, growing sculptures in many shades of green, set off by stones and lichen, offer a more subtle type of beauty.